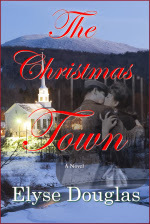 I love reading Christmas-themed stories during the holidays, and The Christmas Town was a perfect holiday read: light, sweet, and full of warm-fuzzy feelings. I liked this book from the first page and that opinion held true for the entire story. There are two female lead characters in The Christmas Town: Jackie and Megan. Jackie and Megan were very different from each other but their temperaments complemented each other perfectly: Megan makes impulsive decisions based on her feelings, and Jackie is rational, and thinks everything through. Watching the two women move from acquaintances to dear friends was my favorite part of the story. The romance in The Christmas Town was sweet and very tasteful. I liked that Jackie and Megan's relationships were not the focus of the book, but they were an important part of the plot. The time-travel aspect added a fun layer of depth to the story, and with much of the book taking place in 1943, that fulfilled my yearning for a historical fiction read. There were a lot of things to like about The Christmas Town. The element of predictability kept me from giving this book five stars; but if you take it for what it is: a feel-good story great for the holidays, you'll love it. I love Christmas books but I hear ya, predictability tends to be part of their M.O..